CITES Aims to Protect America’s Largest Aquatic Salamanders. Earlier this month, the U.S. 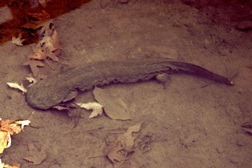 Fish and Wildlife Service (USFWS) listed the eastern hellbender (http://www.dec.ny.gov/animals/7160.html) and the Ozark hellbender in the Convention of International Trade in Endangered Species of Wildlife Fauna and Flora (CITES). This listing aims to control and monitor the international pet trade of hellbenders to help prevent these species from becoming extinct, particularly as they become rarer and, consequently, more valuable in the trade industry. More details of the hellbender CITES listing (http://www.fws.gov/midwest/endangered/amphibians/ozhe/NRFinalListingozhe.html) can be found on the USFWS website. Eastern hellbender’s are found in the Susquehanna and Allegany Rivers in New York State.